I am currently helping to put together a website for an Artist, who paints to Canvas. They would like to create Printed Copies of their Painted Canvas work. The only way I can think of achieving this, is by either Scanning the Painted Canvas or taking a Photograph as to generate a Digital Copy of the Painting. If taking a Photograph is a viable option, is anyone able to point me in the right direction of how best to approach this? For example; Is there a specific Camera/Lens, do I need certain settings on a Camera, would I need to take a Photograph and then edit it in Photoshop? I am not a Photographer myself, so any pointers on this matter would be greatly appreciated. Making a worthy copy of art work is one of photography’s most challenging tasks. You will find that pleasing the artist is next to impossible. This is because he/she will have both the original and your copy side-by-side. The reason this is arduous is because the photographic process optimizes skin tones and certain so called “memory” colors. Artist tends to demand more than our media can deliver. That being said, here is the recipe. Make sure the camera and the art work are square with each other. Use a level and ruler to help position the camera. Use a moderate telephoto lens. This will force you elongate the camera to subject distance. This extra distance minimizes distortion that otherwise will result in an image that is other than a perfect rectangle. Lighting must be uniform across the entire work or art. Lamps should be set at a 45° angle to the flat art work. These also should be backed away to help improve uniformity. You can uses bed sheets between lamp and subject to defuse. You might find that the best lighting is outdoor full shade on a sunny day. Set the exposure so that the lens is operating about 2 f-stops below maximum aperture. Likely this will be your sharpest lens setting. Do use a tripod as this will improve sharpness and give you a better ability to duplicate your composition if you need to repeat the session. Reflections from the art work are difficult to deal with. Use a polarizing filter on the camera. This filter must be rotated as you compose. The idea is to mitigate reflections as best you can. A professional setup will also have large polarizing filters over the lamps. It will help if you have a gray card. You can take your exposure readings, not from the art work but from a gray card positioned center on the work of art. After the reading, remove the gray card for the exposure. If you are sending out the work to be printed by a lab, each shot should be duplicated with a gray card centered on the work. This will assist the lab to make the necessary color balance adjustments. Again you are setting out to accomplish a challenging task and the learning curve is steep. To me, the technical differences between building a website and reproducing artwork in print are substantial. My recommendation is to hire an experienced professional to perform the art reproduction. Depending on the level of quality expected a local printer's shop may be sufficient. While in theory it might be possible for an inexperienced person to reproduce artwork of salable quality with the proper equipment, the cameras, lenses, lights, fixtures, printers, scanners, etc. are going to represent a substantial cost that is not amortized across multiple clients...and the odds of success will still be lower than hiring an experienced professional. Skill in the handling of fine art is another consideration. Reproduction may require removing frames and/or matting and packing, moving and storing fine art requires attention to details that with which most people are not familiar. Alongside that insurance that specifically covers liability for damage to the art is probably a good idea. 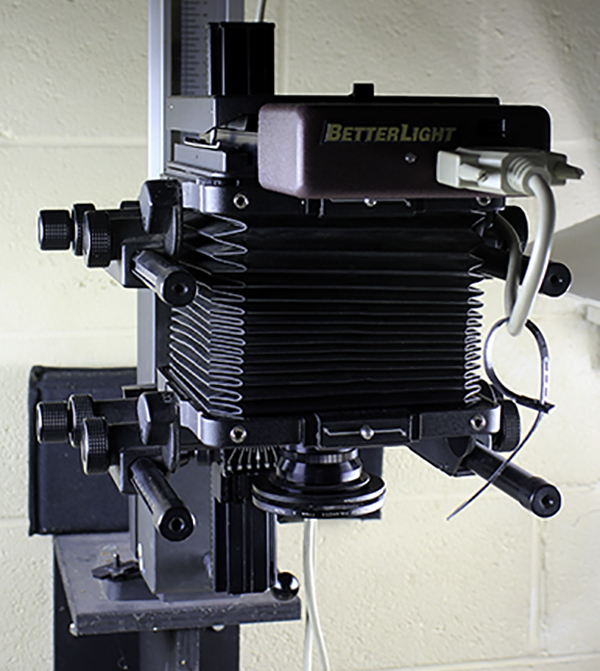 Medium or large format camera, either film or digital. Most commercial services that specialize in high end artwork reproduction now use cameras with digital scanning backs. Unlike a typical digital camera that exposues the entire frame almost instantly using a grid of pixels, a digital scanning back runs from one side of the focal plane to the other scanning a single line at a time much like the scanning element in a flatbed scanner. Full frame digital cameras are beginning to approach the resolution need to do high quality art reproduction if the reproduction is fairly small in size. A 50MP digital camera can handle reproductions up to almost 30 inches on the long side at 300 pixels per inch, but for fine artwork reproductions 600 ppi is preferred, and this limits the long side to about 15 inches. Scanning backs also avoid the disadvantages inherent in using a Bayer-masked sensor. A shooting table similar to an enlarging table upon which the artwork is laid flat and the camera is mounted above it looking straight down from a fairly large distance. The camera should be perfectly centered and perfectly perpendicular to the art if it is a flat medium. When using a digital scanning back, larger pieces are usually reproduced by moving the camera over different sections of the work and stitching together the resulting scans. A very precise system of rails is needed to maintain the correct angle and distance from the table. If using a conventional film or digital camera, such a table for larger sizes of artwork requires a studio with unusually high ceilings. One also should be able to totally control the ambient light in the room. No rooms with vaulted ceilings and skylights would be appropriate unless one is committed to working only at night or willing to fit the windows with 100% opaque covers. High quality studio lighting capable of very high color consistency and power output consistency from one shot to the next. These lights should be properly modified to evenly disperse the light over the entire piece and be placed at an angle sufficient to give enough contrast to the texture without creating excessive shadows. Depending on the reflectivity of the artwork, polarizing films may be needed between the lights and the art to minimize glare from reflections. If the camera uses a digital scanning back, the lighting must be continuous, rather than stroboscopic. This also adds to the cost. Beyond the required equipment to do it justice, the skill needed to utilize the equipment is substantial. Not the answer you're looking for? Browse other questions tagged canvas painting or ask your own question. What are the best practices for taking pictures of a canvas? Where to get IKEA Premiar sized canvas prints for the same rate?